In a previous blog entry, see here, we discussed how survival analysis methods could be used to determine the profitability of P2P loans. The “trick” highlighted in that previous post was to focus on the profit/loss of a loan – which in fact is what you actually care about – rather than when and if a loan defaults. In doing so we showed that even loans that default are profitable if interest rates are high enough and the period of loan short enough. Given that basic survival analysis methods shed light on betting strategies that could be profitable, are there more aggressive approaches that exist in the healthcare community that the financial world could take advantage of? The answer to that question is yes and it lies in using crowdsourcing as we shall now discuss. Over recent years there has been an increase in prediction competitions in the healthcare sector. One set of organisers have aptly named these competitions as DREAM challenges, follow this link to their website. Compared to other prediction competition websites such as Kaggle here, the winning algorithms are made publicly available through the website and also published. A recurring theme of these competitions, that simply moves from one disease area to the next, is survival. The most recent of these involved predicting the survival of prostate cancer patients who were given a certain therapy, results were published here. Unfortunately the paper is behind a paywall but the algorithm is downloadable from the DREAM challenge website. The winning algorithm was basically an ensemble of Cox proportional hazards regression models, we briefly explained what these are in our previous blog entry. Those of you reading this blog who have a technical background will be thinking that doesn’t sound like an overly complicated modelling approach. In fact it isn’t – what was sophisticated was how the winning entry partitioned the data for explorative analyses and model building. The strategy appeared to be more important than the development of a new method. This observation resonates with the last blog entry on Big data versus big theory. So what does all this have to do with the financial sector? Well competitions like the one described above can quite easily be applied to financial problems, as we blogged about previously, where survival analyses are currently being applied for example to P2P loan profitability. So the healthcare prediction arena is in fact a great place to search for the latest approaches for financial betting strategies. 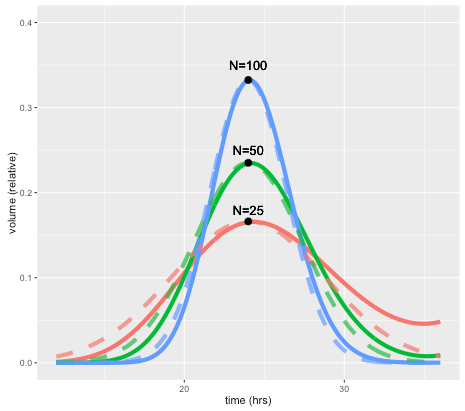 In a previous blog post we highlighted the pitfalls of applying null hypothesis testing to simulated data, see here. We showed that modellers applying null hypothesis testing to simulated data can control the p-value because they can control the sample size. Thus it’s not a great idea to analyse simulations using null hypothesis tests, instead modellers should focus on the size of the effect. This problem has been highlighted before by White et al. which is well worth a read, see here. Why are we blogging about this subject again? Since that last post, co-authors of the original article we discussed there have repeated the same misdemeanour (Liberos et al., 2016), and a group of mathematical oncologists based at Moffitt Cancer Center has joined them (Kim et al., 2016). The article by Kim et al., preprint available here, describes a combined experimental and modelling approach that “predicts” new dosing schedules for combination therapies that can delay onset of resistance and thus increase patient survival. They also show how their approach can be used to identify key stratification factors that can determine which patients are likely to do better than others. All of the results in the paper are based on applying statistical tests to simulated data. The first part of the approach taken by Kim et al. involves calibrating a mathematical model to certain in-vitro experiments. These experiments basically measure the number of cells over a fixed observation time under 4 different conditions: control (no drug), AKT inhibitor, Chemotherapy and Combination (AKT/Chemotherapy). This was done for two different cell lines. The authors found a range of parameter values when trying to fit their model to the data. From this range they took forward a particular set, no real justification as to why that certain set, to test the model’s ability to predict different in-vitro dosing schedules. Unsurprisingly the model predictions came true. After “validating” their model against a set of in-vitro experiments the authors proceed to using the model to analyse retrospective clinical data; a study involving 24 patients. The authors acknowledge that the in-vitro system is clearly not the same as a human system. So to account for this difference they perform an optimisation method to generate a humanised model. The optimisation is based on a genetic algorithm which searched the parameter space to find parameter sets that replicate the clinical results observed. Again, similar to the in-vitro situation, they found that there were multiple parameter sets that were able to replicate the observed clinical results. In fact they found a total of 3391 parameter sets. Having now generated a distribution of parameters that describe patients within the clinical study they are interested in, the authors next set about generating stratification factors. For each parameter set the virtual patient exhibits one of four possible response categories. Therefore for each category a distribution of parameter values exists for the entire population. To assess the difference in the distribution of parameter values across the categories they perform a students t-test to ascertain whether the differences are statistically significant. Since they can control the sample size the authors can control the standard error and p-value, this is exactly the issue raised by White et al. An alternative approach would be to state the difference in the size of the effect, so the difference in means of the distributions. If the claim is that a given parameter can discriminate between two types of responses then a ROC AUC (Receiver Operating Characteristic Area Under Curve) value could be reported. Indeed a ROC AUC value would allow readers to ascertain the strength of a given parameter in discriminating between two response types. The application of hypothesis testing to simulated data continues throughout the rest of the paper, culminating in applying a log-rank test to simulated survival data, where again they control the sample size. Furthermore, the authors choose an arbitrary cancer cell number which dictates when a patient dies. Therefore they have two ways of controlling the p-value. In this final act the authors again abuse the use of null hypothesis testing to show that the schedule found by their modelling approach is better than that used in the actual clinical study. Since the major results in the paper have all involved this type of manipulation, we believe they should be treated with extreme caution until better verified. The title of this blog entry refers to a letter published in the journal entitled, CPT: Pharmacometrics & Systems Pharmacology. The letter is open-access so those of you interested can read it online here. In this blog entry we will go through it. The letter discusses a rather strange modelling practice which is becoming the norm within certain modelling and simulation groups in the pharmaceutical industry. There has been a spate of publications citing that tumour re-growth rate (GR) and time to tumour re-growth (TTG), derived using models to describe imaging time-series data, correlates to survival [1-6]. In those publications the authors show survival curves (Kaplan-Meiers) highlighting a very strong relationship between GR/ TTG and survival. They either split on the median value of GR/TTG or into quartiles and show very impressive differences in survival times between the groups created; see Figure 2 in  for an example (open access). Do these relationships seem too good to be true? In fact they may well be. In order to derive GR/TTG you need time-series data. The value of these covariates are not known at the beginning of the study, and only become available after a certain amount of time has passed. Therefore this type of covariate is typically referred to as a time-dependent covariate. None of the authors in [1-6] describe GR/TTG as a time-dependent covariate nor treat it as such. When the correlations to survival were performed in those articles the authors assumed that they knew GR/TTG before any time-series data was collected, which is clearly not true. Therefore survival curves, such as Figure 2 in , are biased as they are based on survival times calculated from study start time to time of death, rather than time from when GR/TTG becomes available to time of death. Therefore, the results in [1-6] should be questioned and GR/TTG should not be used for decision making, as the question around whether tumour growth rate correlates to survival is still rather open. Could it be the case that the GR/TTG correlation to survival is just an illusion of a flawed modelling practice? This is what we shall answer in a future blog-post. This blog entry will focus on a rather long standing debate around model complexity and predictivity for a specific prediction problem from drug development. A typical drug project starts off with 1000’s of drugs for a certain idea. All but one of these drugs is eventually weened out through a series of experiments, which explore safety and efficacy, with the final drug being the one that enters human trials. The question we will explore is around a toxicity experiment performed rather early in the development (weening out) process, which determines the drug’s effect on the cardiac system. Many years of research has identified certain proteins, ion-channels, which if a drug were to affect could lead to dire consequences for a patient. In simple terms, ion-channels allow ions, such as calcium, to flow in and out of a cell. Drugs can bind to ion-channels and disrupt their ability to function, thus affecting the flow of ions. The early experiment we are interested in basically measures how many ions flow across an ion-channel with increasing amount of drug. The cells used in these experiments are engineered to over-express the human protein we are interested in and so do not reflect a real cardiac cell. The experiment is pretty much automated and so allows one to screen 1000s of drugs a year against certain ion-channels. The output of the system is an IC50 value, the amount of drug needed to reduce the flow of ions across the ion-channel by 50 percent. A series of IC50 values are generated for each drug against a number of ion-channels. (We are actually only interested in three.) The reason why a large screening effort is made is because we cannot test all the compounds in an animal model nor can we take all of them into man! So we can’t measure the effect of these drugs in real cardiac systems but we can measure their effect on certain ion-channel proteins which are expressed in the cardiac system we are interested in. The question is then: given a set of IC50 values against certain ion-channels for a particular drug can we predict how this drug will affect a cardiac system? As mentioned earlier, drug development involves performing a series of experiments over time. The screening experiment described above is one of many used to look at cardiac toxicity. The next experiment in the pipeline, which could occur one or maybe two years later, is exploring the remaining drugs in an intact cardiac system. This could be a single cardiac cell taken from a dog, a portion of the ventricular wall, or something else entirely. After which, even less compounds are taken into dog studies before entering human trials. So the prediction question could be related to any one of these cardiac systems. The inputs into the prediction problem are the set of IC50 values, three in the cases we will look at, whereas the output, which we want to predict, are certain measures from the cardiac systems described. At this point some of you may be thinking, well if we want to predict what will happen in a real cardiac system then why don’t we build a virtual version of the system using a large mathematical model (biophysical model)? Indeed people have done this. However, others (especially those who follow this blog) might also be thinking, I have three inputs and one output and given we screen lots of these compounds surely the dynamics are not that difficult to figure out, such that I can do something simpler and more cost effective! Again people have done this too. If I were to refer to the virtual system (consists of >100 parameters) as Goliath and the simple model (3 parameters) as David some of you can guess what the outcome is! A paper documenting the story in detail can be found here and the model used is available online here. I will just give a brief summary of the findings in the main paper. The data-sets explored in the article involve making predictions in both animal studies and human. Something noticeable about the biophysical models used in the original articles was that a different structural model was needed for each study. This was not the case for the simple model which uses the same structure across all data sets. Given that the simple model gave the same if not better performance than the biophysical models it raises a question: why do the biophysical modelling community need a different model for different studies? In fact for two human studies, A and B, different human models were used, why? The reason may be that the degree of confidence in those models by people using them is actually quite low, hence the lack of consistency in the models used across the studies. Another issue not discussed by any of the biophysical modeling literature is the reproducibility of the data used to build such models. Given the growing skepticism of the reproducibility of preclinical data in science this adds further doubt to the suitability of such models for industrial use. Given the points raised here (as well as a previous blog entry highlighting the misuse of these models by their own developers) can the biophysical modelling community be trusted to deliver a modelling solution that is both trustworthy and reliable? This is an important question as regulatory agencies are now also considering using these biophysical models together with some quite exciting new experimental techniques to change the way people assess the cardiac liability of a new drug.